Google Traffic Map at 5:30 p.m. Monday. It’s a nightmare on the northern Jersey Shore roadways this evening. 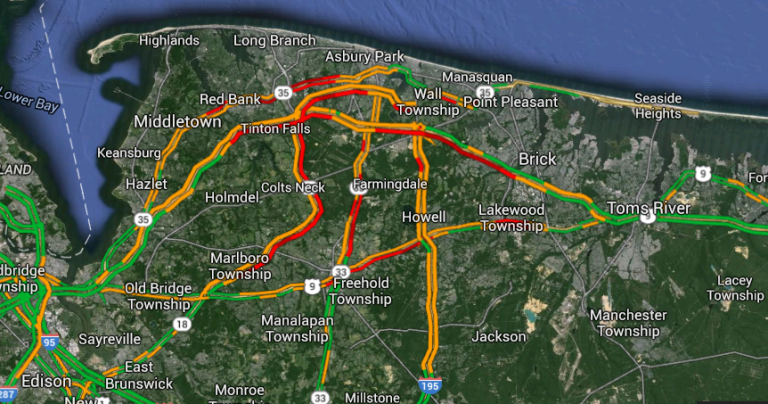 The combination of icing due to crashing temperatures, earlier snowfall, and typical volume is resulting in heavy traffic on numerous thoroughfares throughout Monmouth and northern Ocean counties. 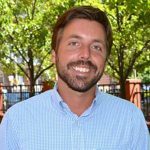 At 5:30 p.m., JSHN contributors report heavy traffic along the entire southbound stretch of the Garden State Parkway from the Tinton Falls area to Brick as well as on every major roadway in the area. “Tires don’t mean anything on ice,” commented JSHN contributor Jim McCloskey. Heavy traffic began during the mid-afternoon as temperatures crashed and roadways became icy. Authorities reported numerous spin-outs and crashes, but none resulted in serious injuries. In Tinton Falls, motorists were stuck on the Exit 105 ramp onto the Garden State Parkway southbound lanes for over an hour around 4:00 p.m. due to a disabled vehicle. Icing forced the closure of the Route 36 Highlands Bridge, which connects Highlands and Sea Bright, shortly before 4 p.m. It was reopened about an hour later, according to Sea Bright Mayor Dina Long. Forecasters expect temperatures to continue plunging below the freezing mark this evening, leading to additional icing and treacherous road conditions. Increasing winds will spur bitterly cold wind chill values.